Yaaay! 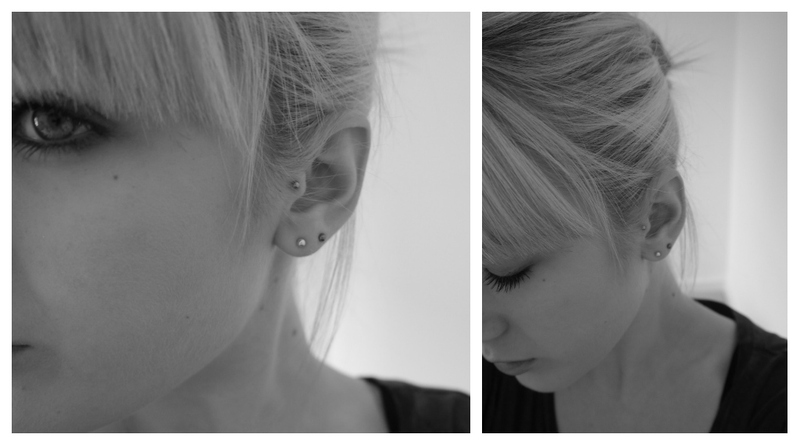 Here it is guys - my new tragus piercing! I'm so pleased with it and surprisingly it seems to have healed really quickly! I was so nervous before I had it done because I'd been told by a few people that it was going to hurt loads - I'm not going to lie, it did hurt when the needle went in, but it wasn't that bad and it was done so quickly I didn't really have time to think about it. I felt a bit of pain when the ball was screwed on and then it was all over - immediately afterwards I couldn't feel it at all, in that respect I found it less painful than my lobes! A couple of people I know said that when they had it done, they couldn't sleep on it for a few days - I avoided resting on it the first night but after that it was fine. A week on and I never feel it, I've been cleaning it twice a day and I can twist it and everything without pain - really not as bad as I expected! Looks so good! I haven't even had one pierced yet.. I want that so bad I'm such a chicken. I freakin' love your arm candy dude! your piercing looks really good! and yes those shorts are gorgeous aren't they! I got my tragus pierce last year, and was totally in love with it... but it never healed so I had to take it out! Hopefully yours will heal fully, because it looks wonderful on you!! Congrats with the piercing! I like it! I just have my ears and belly pierced :) Thanks for the follow am following you back! First Thanks For Following!! ...Second Is That A Pandora I See Love The Suitcase Charm! This looks lovely, I wish I was brave enough to have it done. That looks so good, I need to get some tragus bars, I pierced my own but I just put normal earrings in there so I need to get bars because they're wider. iih!! it looks awesome on you! I had both mine done last year :D soo happy!